Like everyone else, I thought it was a nice light, barely used it and the hinge broke. $40 ? Thanks alot! Broke 3rd time I used it. Do not buy this headlamp. I am very careful but, the hinge broke after a few uses. not very durable where the strap connects to the lamp, it broke from the little pin and its nor repairable so now have to hold it without the strap. This item doesn’t accept rechargeable batteries. I did not know that until after I purchased that. 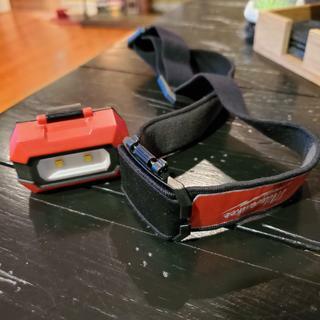 The rechargeable batteries work for any other headlamp but for some reason it’s not compaitable for this headlamp. Being an electrician in a aircraft carrier, flashlights just don’t cut it. I figured this light would be worth the money as everything else I use is Milwaukee. Impulse buy, haven’t had the hinges break , but it does not stay on the high beam setting, it goes drone the high to medium then it starts flashing and cuts off. Would not recommend. I have several Milwaukee tools with a great performance so I bought this lamp without hesitation and after I used a couple of time broke at the hinge, a very disappointing lesson, do a research before buy even for a small tool. Bracket broke very easy and they don't sell a replacement. BEST ANSWER: Hi Leonard, CPO Outlets only sells only. We currently don't have any retail stores.